It felt like an elephant was sitting on my chest. It had been like that for days; and while I knew this was normal, I just wanted a moment when I could genuinely smile and laugh like before. I have a long history of pushing stuff under the rug. The problem is, your “rug” can only hide so much stuff before it starts tripping you up. I had promised God that this time I’d give myself time to grieve. I’d do it in a healthy way so that I wasn’t overcome by it, but that I wasn’t hiding from it either. God answered me that day with something that I read in chapter 3 of Grieving With Hope. Interestingly, I didn’t read chapter 3 until just now, so as I saw the list of questions Samuel L. Hodges IV gives I smiled to myself because I knew the value in the advice he was giving. In chapter 3 of Grieving With Hope, we find that sometimes new grief can bring up the pain of old loss. This is completely normal as it reminds us of similar losses we have experienced. The pain of my 3rd miscarriage was so great that the intensity of it took me by surprise. It was far greater than the first two. I wasn’t prepared to deal with it. In fact, I did everything I could to not have to face it. I buried myself in work and comfort food. As long as I had a distraction and kept my taste buds happy, I could pretend it had never happened. It did. And ignoring the pain of loss doesn’t make it go away. It only lets it fester inside. And I learned this when only a year later I had my 4th miscarriage. I knew that I had to face both losses because the pain was too great now to ignore. I did for a time, but my escape to work and food was a lot easier than feeling. So, when we lost my dear friend Mandy, I knew that the pain of her loss would bring up past losses….ones I’d grieved and the ones that I hadn’t. I sat down with a pen and paper and began to list all of the losses I’d failed to properly grieve. I didn’t just list the deaths of my grandparents, or my miscarriages, but also loss of friendships, dreams, ideals, and opportunities. When my list was complete, I went back and listed the ways I’d chosen to escape from the pain of those losses. Upon completing this project, I asked the Lord to forgive me for turning to other things for comfort and peace, instead of Him. Grief is an opportunity to get to know the Holy Spirit on a much deeper level. The Comforter becomes more real to us as we allow Him to truly comfort us! I think one of the reasons why this generation has become so obsessed with living in the present is because our lives move too quickly to really deal with the past. If we are unwilling to take that time to properly grieve our losses, we will never really be able to move forward. But when we take the time to finally grieve and walk into our present, while in some cases the pain will always be with us, we’ll not live in the pain. We’ll be able to enjoy our loved ones’ presence and soak in those precious moments now, without letting them pass us by as we live in the pain of past loss. 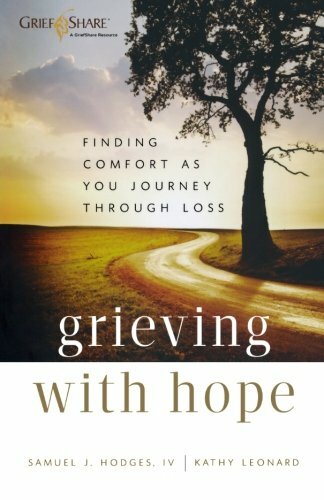 If you’re feeling the weight of unresolved loss, I encourage you to pick up a copy of Grieving With Hope and take the time to go back and grieve those losses, so that you can move forward in the peace and comfort of the Holy Spirit. Read the previous post: « Am I A Man-Pleaser? Yes – there are so many reasons why we grieve. Oh Rosilind, how I needed to read your words. I’m tripping all over the rug that I’ve swept grief under … for many years. It’s time to allow myself to actually grieve there losses with hope not fear. Grief can be so scary ! Thank you for helping me to begin the process ! It can be very scary. I would encourage you to get the book, if you haven’t already. I have found it tremendously helpful to me. I pray that as you allow yourself to finally grieve, that you will find your faith in God deepen.